Here comes the kids most favorite carrot cake recipe. This tastes utlimately moist & sweet with inviting flavors. Also its simple and quick to prepare at home. Nothing can beat the homemade classic carrot cake with a speck of raisins and walnuts on it. 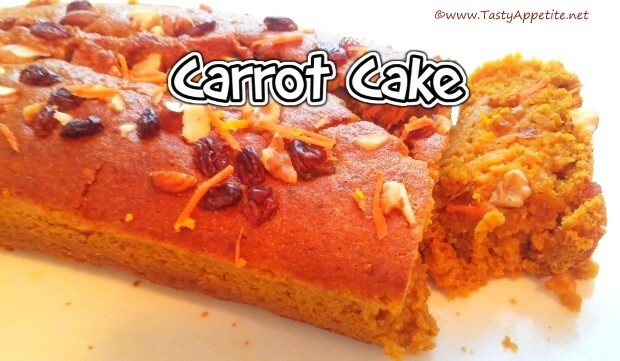 Make incredibly moist carrot cake in your home with this easy video recipe! Wash, peel and slice carrots to fine pieces. Break 2 eggs and add. Add cooking oil and blend together to smooth frothy paste. In a mixing bowl, take all purpose flour and seive to remove any lumps. Add powdered sugar, baking pwd, baking soda, salt and mix. Add carrot paste from the blender. Fold both the dry and wet ingredients gently to smooth batter. The batter consistency should be as its shown in video. Grease a cake tin with oil and place butter paper at the bottom. Pour the cake batter in the tin. Tap the tin to remove air bubbles if any. Sprinkle some raisins & chopped almond, walnuts and pista nuts on the top. Pre-heat oven at 180 degree celcius for 10 mins. Place the cake tin in the oven and bake the cake for 50 to 55 mins at 180 degree celcius. Once the cake is golden brown and done, remove from oven. Cool in wire rack for 10 mins. Deliciously rich, soft & moist homemade carrot cake is ready. Its optional, if you wish you can top up the cake with cream cheese icing. It makes a healthy snack or dessert for everyone especially kids.